Cervical discs are shock-absorbing pads of tissue cushioning bones of the cervical spine. A variety of injuries to these discs can cause pain and hamper movement and flexibility of the neck. Slipped discs occur when the gel-like substance leaks from the disc’s interior, following a split or rupture to the disc. This substance can then exert pressure on the spinal cord or nerves of the cervical spine. The intervertebral discs absorb shock, facilitate movement, and provide support for the spinal column. Such discs consist of a center region or nucleus pulposus and a surrounding annulus fibrosis separating each segmental vertebra between the cervical spine and thoracic spine.Disc degeneration and / or herniation (disc rupture) can cause injury to the spinal cord or nerve roots. Disc degeneration and loss of elasticity. Repetitive stress, particularly from excessive or improper weight lifting. Sudden, forceful trauma to the cervical vertebrae. Tingling and weakness. Numbness or pain in the neck, shoulder, arm, or hand. Motor and sensory dysfunction in the affected cervical area. 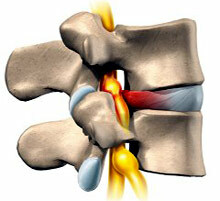 Herniated or slipped discs can impinge on the spinal cord, an extremely delicate structure. Even minor damage to the spinal cord can be serious and is generally not reparable. Ignoring cervical disc injuries can lead to further degeneration and associated pain and mobility loss. Discontinue activity causing stress to cervical vertebrae and discs. For most slipped disc injuries, a conservative course of treatment is undertaken. Physical therapy includes stretching, strengthening and proprioceptive exercises and sometimes, efforts to adjust posture. Upper body exercise may help prevent disc hardening and degeneration, while strengthening supporting muscles will lower the risk of rupture. The majority of slipped or herniated disc injuries improve without recourse to surgery. Most athletes cane expect a full return to normal performance following rest and rehabilitation, though symptoms of the injury occasionally recur and degenerated discs are prone to re-rupturing. Call (+65) 6471 2674 (24 Hour) to fix an appointment to see our orthopaedic specialist regarding slipped disc today.